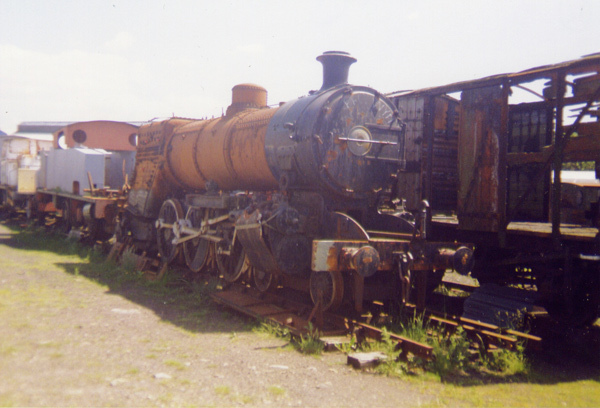 M2 under gradual static restoration at the Tanfield Railway in 2000. This photo was provided by Mark Smithers. M2 started life as M10 (Robert Stephenson & Hawthorns Ltd b/n 7430 of 1951) and, as such, was the last steam loco built for the Tasmanian Government Railways (T.G.R). She wasn’t the last into traffic however; that distinction fell to M7 (RS&H 7427 of 1951) which later became M1 under the 1958 re-numbering of most of the class as a result of the four ‘MA’ conversions. M10 had spent most of her early years attached to Launceston shed and duties would have included regular workings on the North-Eastern line. After her second ‘D’ overhaul (Intermediate or Light General), M10 was re-issued to traffic on 20th Dec. 1955 and soon made her way to Devonport shed to take a share in the “Workers Flyer” roster with M6 (RS&H 7426 of 1951) which later became MA3. Devonport ‘M’ class also occasionally relieved the Smithton-based ‘M’ class. M10 was re-numbered to M2 by 31st. July 1958. By July 1959, Launceston had the four ‘MA‘ pacifics on its roster. Hobart held onto M1 (ex-M7) and grossly under-utilised it. The other five were now all based on the three north west coast sheds: Devonport claimed two (M4 & 5), Wynyard also had two (M2 & 6) whilst Smithton was allocated one (M3). This was the high-water point of ‘M’ class utilisation in the north-west. Next month, M3 was recalled to Launceston for a ‘D’ overhaul and then there were only four. M2 returned to Launceston late February 1960 for her next ‘D’ overhaul: this time it was a fairly lengthy job and she was in the shops from early March through to July. On release, she was returned to Devonport shed. The next ‘M’ class taken in for tone-up was M6 whilst M1, with a class-low mileage of 88,688 miles, was stored, awaiting her turn through the workshops – it never came. T.G.R. probably thought that it was worth storing such an under-utilised loco until the much higher mileage class members needed heavy general repairs. M2 continued in service for another year and during that time, the allocation of class members became static. M2 and 3 shared the Devonport-based turns; Wynyard had, by now, lost it’s allocation and Smithton held onto M4 to work the Smithton-Wynyard fast goods. M2 last ran in July 1961 and was held at Devonport pending repairs and replaced by M6. Eventually, she was towed to Launceston and placed into storage ‘pending instructions’. Despite the previous lengthy overhaul, M2’s mechanical condition was quite run down: amongst other work, she needed new tyres all round – something T.G.R. could not justify given the shrinking amount of work available for the remaining active steam fleet. However, her boiler was in very good condition and she took part in the first boiler-lift and transplant of any of the post-war steam locos. MA2 had entered the works in August 1961 and was mechanically sound but her boiler needed a great deal of work. It was easier to pull the good boiler from M2 and swap it into MA2. The ‘MA’ class were considered to be more useful than the ‘M’ class even though there was little difference between a good ‘M’ and an ‘MA’ on the remaining work. M2 went back into storage, somewhat re-assembled, with a shabby red boiler contrasting the faded green cab and tender. But the cannibalisation didn’t end there. Shortly after, her tender body was grounded and the bogies modified for use under the “Mole” tunnel boring machine – she never got them back. - Tender ex-H2 (originally came from H5 RS&H 5953) – red paint in good condition. She was also devoid of most boiler and cab fittings. The Stanley Tourist and Progress Association went to work on the mongrel loco and did a reasonable job of the cosmetic restoration but a trained eye could tell that there were many parts missing. Time, vandals and the salt air all took their toll: eventually the loco was considered a liability. The Don River Railway recovered the loco and stored it prior to preparation for shipment back to England. The Tanfield Railway group were on the look out for locos that had been built in the Newcastle – Darlington area. Their railway is approximately 5 to 7 miles south west of Newcastle. A Tanfield member, Eric Maxwell, bought M2 which was partially disassembled and shipped back in containers. However, as the cab was badly rusted, it wasn’t worth sending. She now stands awaiting some sort of restoration but is a stranger in the land of her birth. Eric is working on the loco in the open, virtually as a one-man-band. It will be many years before M2 will ever look complete - her condition upon arrival was akin to many of the wrecks pulled out of Barry scrapyard. I just hope fate will be kinder to her there than it was here but the rebuild will not be cheap. The original tender bogies were used as workshops bogies for putting under locos being overhauled; not sure where they are now. They were the only M/MA/H class tender bogies directly fitted with a wagon-style handbrake! If I recall correctly, the RS&H 7430 tender body was sent to Mowbray for scrapping in the last big clean-out of steam equipment by Australian National Railways in late 1978. M2's original boiler is still in use in MA2 at the Don River Railway. All information on this page was provided via email by Melanie Dennis.